An energetic if grim discussion of inequality and the coming era of underemployment, viewed through the lens of the forgotten American progressive narrative. McChesney (Communications/Univ. of Illinois; Digital Disconnect: How Capitalism is Turning the Internet Against Democracy, 2013, etc.) and Nation Washington, D.C., correspondent Nichols bring clear urgency to this sprawling polemic, which encompasses politics, the cybereconomy, the decline of critical journalism, and historical movements beginning with America’s founding. They describe the post-2008 recession era as a “maelstrom” of inequity, pointing toward worse times in the labor market: “the debate about where technological change is headed is already settled in the circles of those who intend to profit from that change.” This pessimism is linked to what the authors convincingly portray as the decay of representative governance. Both parties, they argue, have pursued tax and trade policies that have stealthily undermined blue-collar jobs and middle-class stability. “This is the means,” they write, “by which unelected bankers and billionaires most effectively and steadily define the popular discourse.” Such dire chapters contrast with a vividly rendered history of the development of a now-tattered “democratic infrastructure,” beginning with the state constitutional conventions of the late 18th century, more populist than what ultimately became the U.S. Constitution. The authors follow this thread through the Progressive Era and Franklin Roosevelt’s New Deal, portrayed as the precursor to an ambitious “Second Bill of Rights,” forgotten at the dawn of the Cold War. Similarly, a fascinating chapter documents a forgotten progressive coalition poised to achieve great gains during the 1970s, only to be thwarted by the recession and a cunning pro-business lobby: “There was a tenfold increase in corporate federal lobbying by the 1980s.” McChesney and Nichols conclude with a lengthy proposition for how the ranks of the underemployed could similarly regroup to protect workers’ interests. “Economic planning needs to be democratized and popularized and made accountable,” they write. 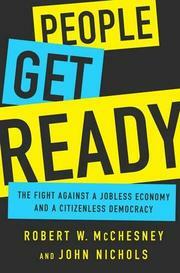 An authoritative account of the challenges facing progressives wishing to fuse better governance with economic justice.